The beauty about VOD platforms like Netflix, Amazon et al is that not only can they store all types of films in their extensive libraries, but they can also be the exclusive platform for films that for whatever reason cannot find theatrical distribution, probably because their overall quality is that of something that should have no business being shown in a cinema with paying audiences. Unfortunately, Double Date is not one of those films, and is instead something that is playing right now in cinemas nationwide instead of being released to Netflix where, given the quality on display, it should have felt right at home. At least then, if you wanted to you could pause the movie and go about your day if you’re not enjoying it; in a giant cinema auditorium, however, it’s much more punishing to sit through. It’s about Jim (Danny Morgan, also the film’s writer), a socially-awkward 29-year-old who’s yet to lose his virginity, much to the annoyance of his cocky best mate and self-designated wingman Alex (Michael Socha). Luck seemingly comes their way when they meet two beautiful sisters, Kitty (Kelly Wenham) and Lulu (Georgia Groome), who agree to go on a night out with them… but unbeknownst to them, they are actually a couple of deadly serial killers hell-bent on sacrificing virgins for a satanic ritual that would bring back their dead father. To say that would make for an awkward night out would be an understatement, as things certainly do go a bit more pear-shaped as the film goes on, but the fact is that it’s mostly just an unpleasant and largely unfunny set of situations that you really don’t care about what’s going on, and you just want it to end sooner rather than later. It’s a rather ugly film to look at, from the unappealing colour palette of reds, ambers, and sometimes even greens – reflecting the stop, start and go of the movie’s pacing, which prevents this movie from getting into full gear until much later on – to the shaky and discombobulating camera work that debut director Benjamin Barfoot incorporates into scenes that don’t even require it. Watching it is an endurance test, to see how uninviting it can be in how it is filmed and edited to make you realise how many other better things you could be doing with your time. It really doesn’t help, like at all, that the main characters in this movie are so obnoxious and irritating that you really want these girls to slaughter them as soon as they get the chance. Morgan is playing such a wet blanket and weak-willed person who lets everyone just walk all over him, and he’s not that strong of an actor so you don’t buy the naivety he’s trying to get across. Even more unbearable is Socha as Alex, the unholy love child of Jay from The Inbetweeners and Costa from Project X, neither of whom should be breeding in the first place, who is such a knob-head and an unlikeable sleazebag you just want to punch him. He has this extended fight sequence near the end where he should be easily defeated, but sadly he not only survives but gains the upper hand at numerous points, instead of doing the kinder thing and actually letting him die. Next to these off-putting douchebags, you’re rooting more for these deranged sisters to carry out their nefarious plans, because then at least it would mean that they would end up murdered and mutilated beyond repair. It has absolutely no business being in cinemas, and even on Netflix is the kind of film that should be paused halfway through and never continued, because Double Date is a poor dreck of a film that it’s not even worth the subscription fee. 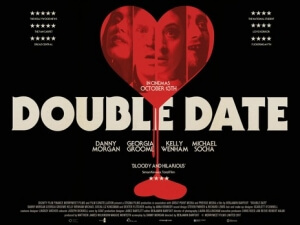 Double Date is an unfunny and rather unpleasant horror-comedy with obnoxious characters and absolutely no reason for it to be playing in cinemas, when VOD would have been more than enough.